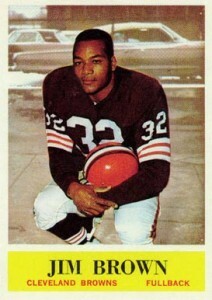 In 1964, the Philadelphia Gum Company secured the rights to produce cards featuring NFL players. 1964 Philadelphia Football was born. It was quite the coup given the fact that the company's longtime rival, Topps, had been making them since 1956. The rights were negotiated in a back-room deal with a former Topps employee, so Topps had little recourse but to switch over to producing cards for the upstart American Football League. As a result, Philadelphia began a four-year string of NFL sets, each containing 198 cards and measuring the standard 2-1/2 by 3-1/2 inches. 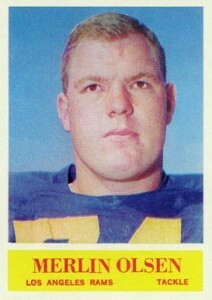 The key rookie cards in 1964 Philadelphia Football are Herb Adderley (#71) and Merlin Olsen (#91). Other rookies include John Mackey (#3), Willie Davis (#72) and Jim Johnson (#161), to name a few. Veterans anchoring the set include Johnny Unitas (#12), Mike Ditka (#17), Jim Brown (#30), Bob Lilly (#48), Paul Hornung (#78) and Bart Starr (#79). 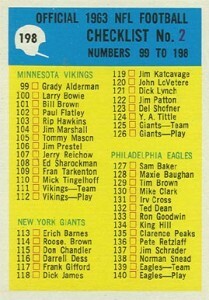 The design of the 1964 Philadelphia Football cards is fairly basic. The posed player photographs are accompanied only by a solid-colored block at the bottom that contains the player's name, team and position. The color of the box was determined by which team is featured. A white border runs around the card and also runs between the photo and the block of text. The card backs are printed with light blue, featuring a helmet-shaped icon with a card number inside, and the player's name, team, position and vital statistics to the right. There are two blocks below that. The first has either yearly and career statistics or a short biography for players whose positions didn't involve statistics. The larger block includes a comical cartoon about the player. The set is uniquely numbered according to team, with players arranged in alphabetical order by their last name. There are 14 cards for every team, with 12 players, a team photo and a play card that shows a diagram of a team play, the team's coach and the home stadium. This system makes it very simple to collate. The play cards are of interest to collectors for featuring Hall of Fame coaches like Vince Lombardi (#84), George Halas (#28) Don Shula (#14) and Tom Landry (#56). 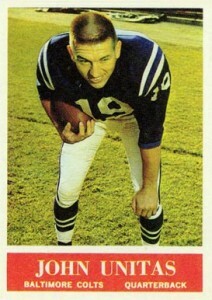 There are a handful of uncorrected error cards most having to do with name spellings as is the case with Herb Adderley's rookie card or other typographical mistakes. There are also two checklist cards, which identify the year as 1963. The date was never corrected. No known variations are said to exist within the set. One interesting note about the 1964 Philadelphia Football card set is the pink Cadillac that appears in the background of all the cards of players on the Cleveland Browns. Hobbyists have claimed it was a car that Jim Brown owned, others say it was a car his dealership sold, and others insist that the pictures were merely taken next to a parking lot. Whatever the reason for it being included, it makes those cards stand out.